Have we mentioned how much you all mean to us? Such a beautiful gift, yin/yang walking stick. Sometimes, Janelle and I just have to stop and take a moment to look around and take account of all the wonderful folks who have helped us on this amazing journey. Now, as we begin the new year, and as I set off on the madness of having a second book release coming in June, I was reminded of just how important you all are. I just returned from a trip that took me through Buffalo, Chicago, Cincinnati and Columbus, where I had the honor of being on the receiving end of some very fine mid-west hospitality. Janelle’s great-aunt Margie has been a kind and active supporter of ours since the beginning of this journey and I finally had the chance to meet her over a cup of tea. Incredibly, she gave me a walking stick, built and painted by her late husband. Janelle and I are continuously reminded of how kind and supportive of this adventure you all have been, never more so then when something like that happens. Thank you Margie, for the very beautiful gift, but also for your support, enthusiasm and love. So, thank you . It means a lot to us. Let’s make 2014 amazing! Sled hard and sled well! The architect of Sunday’s Sledding Derby gets ready for another run. We planned on hiking Tecumseh Sunday, going for Janelle’s third 4,000 footer. 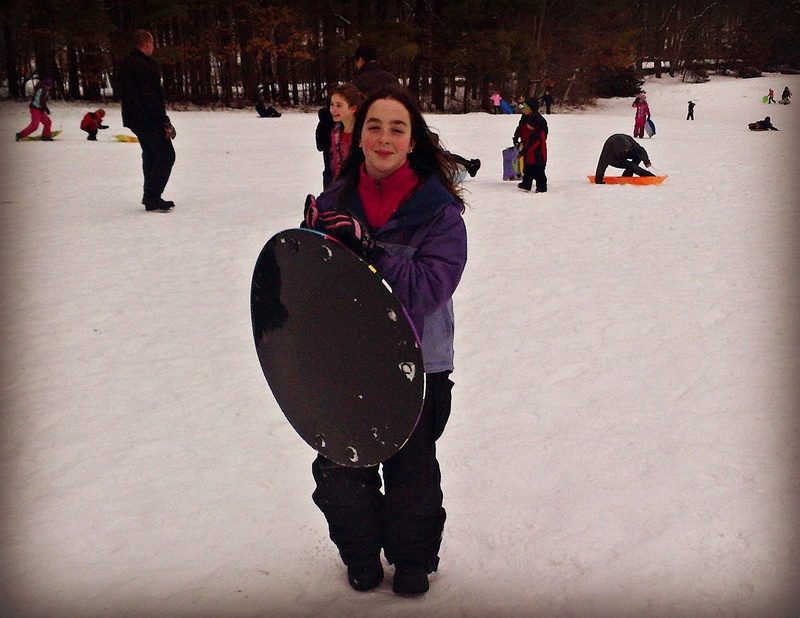 But then, Tough Cookie informed me that instead we would pile as many people in the car as we could, haul our body boards over the Derryfield Hill and sled until our legs were sore and our faces were frozen. Only then, would the massive snowball fight ensue. After that, the enormous fort would be built and then demolished. Then more sledding. The end. So said the girl, and so it was! 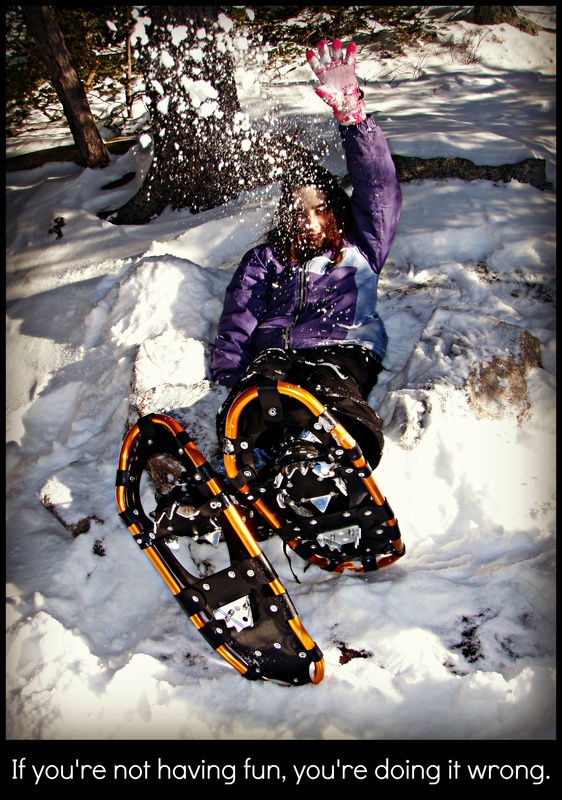 Well, Janelle and I are gearing up for a big winter and spring, touring through New England in support of The Adventures. And I’ll be giving some presentations on Nepal and Alaska as well. We’ll find time to hike and play as well, we hope. And we’ll have some big announcements coming up soon about the next Buffalo and Tough Cookie project. That’s it for now from Buffalo and Tough Cookie Central. Get outside, keep moving and stay inspired! Our early 2014 schedule is starting to take shape and it’s looking very full and exciting! From libraries to luncheons to hiking club events, we’ll be hitting the highways again for readings, signings, slide shows and meet and greets. I have also taken the liberty of adding all the Dan-only events coming up as well. I’ll be giving talks on Nepal and Alaska in the next few months and those should be a lot of fun! For now, I’ll be taking a short hiatus from Social Media to work on and hopefully finish a couple outstanding writing projects. We’ll be back next weekend with more exciting adventures. Till then, hike on! 2014 is here and it’s going to be wonderful! Happy New Year from Buffalo and Tough Cookie central! 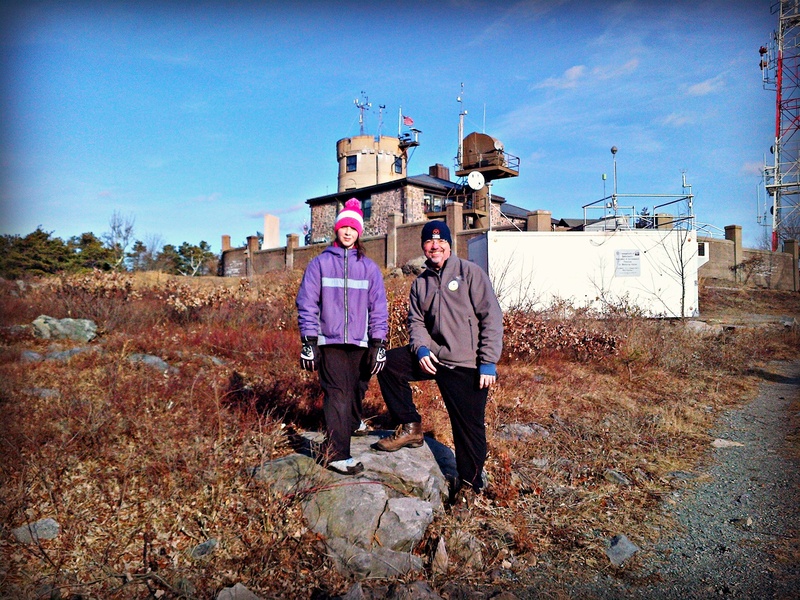 We started our year with a great First Day Hike at Blue Hill Observatory. 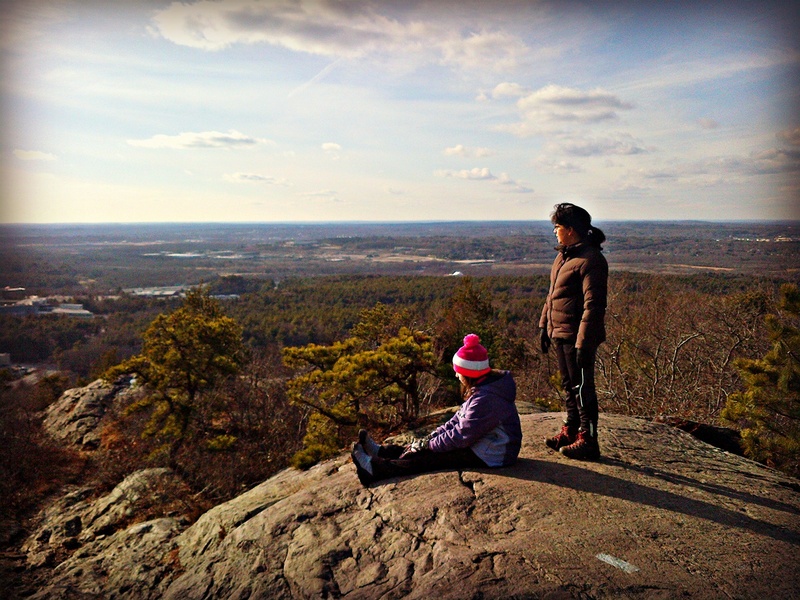 The first quarter of 2014 is getting packed with great events and hikes, we’ll have a full schedule up soon. We’re looking into the future and it’s pretty bright! We hope you’ll all join us. What adventure did you have on the first day of the year?